WCA Barometer holds steady for second month as markets weigh growth, inflation, and rates. 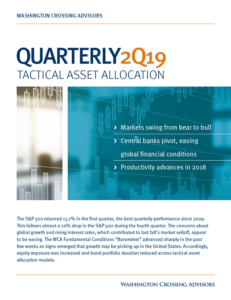 Strong global demand has driven growth and may now be pushing up against supply constraints. 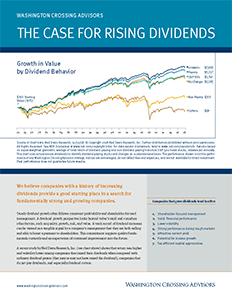 Bottlenecks are leading to higher prices and raising concerns about inflation. Cash and bond markets have been pricing in expectations for firmer inflation and higher policy rates. Consider global commodity prices. Oil, aluminum, wood pulp, and lumber prices all began to spike a little over a year-ago. Oil is up 20%, aluminum is up 15%, pulp is up 25%, and lumber is up 15-20% from a year ago. Analysts serve up a host of reasons for the increases. Tariffs, sanctions, geopolitics, and natural disasters like forest fires are often cited as the “root cause” of the higher price. Other supply side issues, such as capacity constrained trucking and railway operations, add to the story. On the demand side, we see other reasons for rising prices. Not only has global demand been on the rebound since early 2016, but we see steady growth in domestic jobs and emerging market credit. United States’ output reached $17.4 trillion recently, and for the first time, real output exceeds the Congressional Budget Office’s (CBO) $17.3 trillion estimate of “potential” output. At the same time, the U.S. Bureau of Labor Statistics reports the unemployment rate fell to 3.9%, which is below the CBO’s estimate of “full employment.” This indicates that, for now, demand may begin to pushing up against supply, which could explain firming U.S. inflation. Many of the commodity prices discussed above are priced in global markets, where global conditions hold sway. While real growth in global output seems solid, we are also aware that private credit to emerging market economies (ie. China) remains in overdrive. 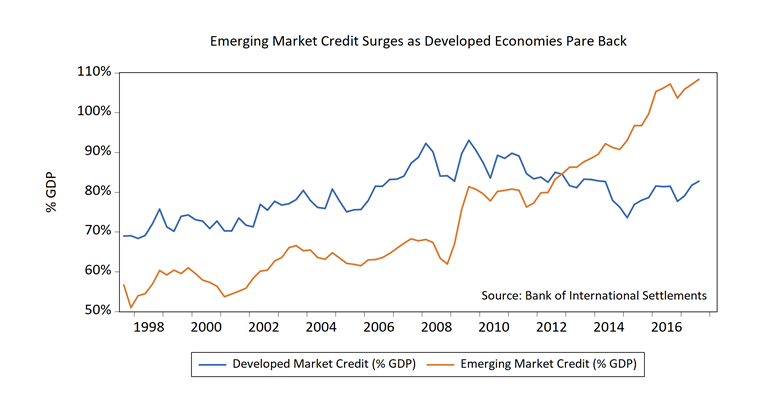 As the chart below shows, private credit in emerging market has grown rapidly to a very high level compared to output. There is no telling when this might end, but past episodes in rapid credit growth often ended suddenly, without warning, and led to a period of retrenchment. 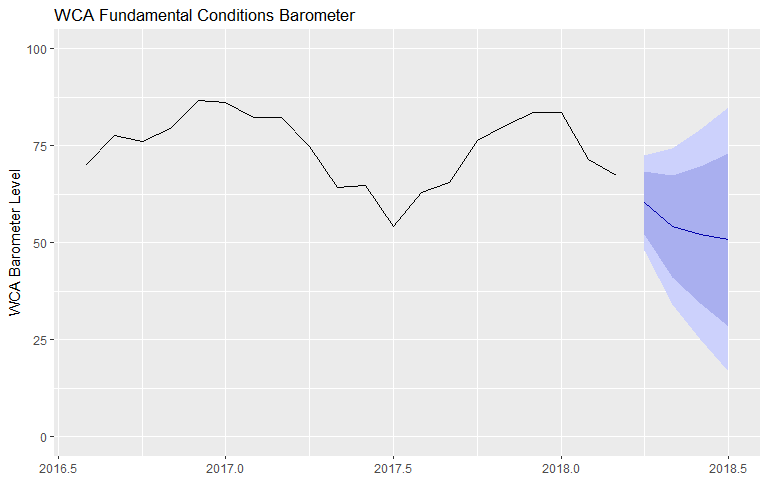 With another month of stability evident in the WCA Fundamental Conditions Barometer, we are making no tactical shift between stocks and bonds at this time. Tactically-managed portfolios remain overweight stocks relative to bonds given our near-term forecast.